Mayan Palace is one of Mexico’s most recognized and visited resort hotels. Families return here year after year to make memories and enjoy the beauty, tranquility, and adventure of the Mexican coast. 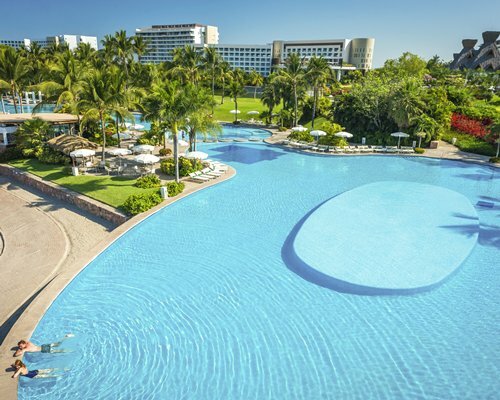 Mayan Palace Nuevo Vallarta is a luxurious resort hotel at the heart of the incredible Vidanta Nuevo Vallarta, giving you a central location to enjoy this unforgettable destination. You'll find a casual and relaxed environment where everyone in the family can find a favorite activity and their happiness. Cozy, comfortable living spaces provide everything you need for a romantic getaway for two or a memorable family vacation with lots of little ones. 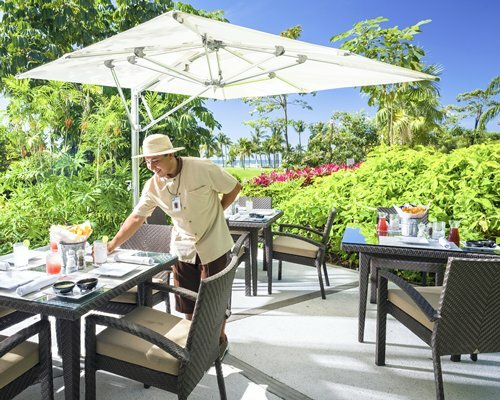 And with a friendly staff who look after you like family, you’ll quickly see why Mayan Palace has helped redefine the Mexican vacation experience. Extra fees for: Valet Parking, Internet, Gym, Spas, Tennis, Golf and Safety Deposit Box. 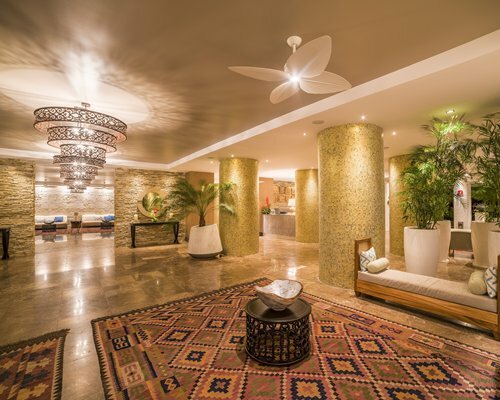 At Mayan Palace Nuevo Vallarta, your days begin and end in luxurious living spaces, tastefully decorated and designed for comfort. 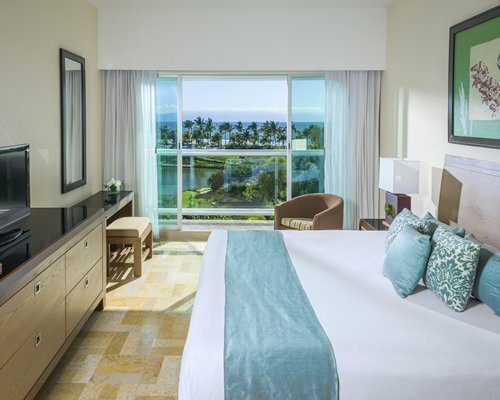 All Mayan Palace units feature private balconies, cable TV, air-conditioning, ceiling fans, telephone, safe, closet, potable water, and marble bathrooms. 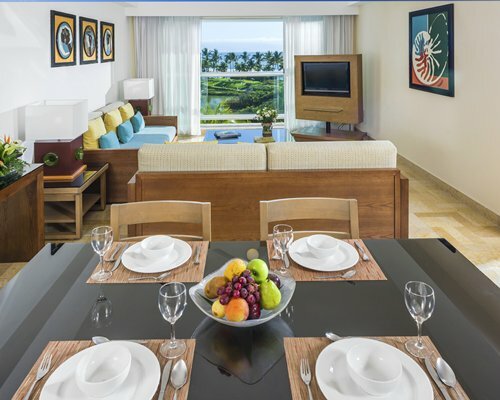 Whether you are vacationing as a couple or as a large, extended family, Mayan Palace Nuevo Vallarta offers spacious units for groups of all sizes: - Hotel Units for up to 2 adults and 2 children under 12 years old, with 1 king or 2 double beds. - 1 Bedroom units for 5 people, with 1 king bed and 2 sofa beds, as well as a kitchenette. - 2 Bedroom units for up to 8 people, (a combination of the two previous units) and a kitchenette. The location of the unit will be assigned upon arrival directly by Mayan Palace. RCI DOES NOT ASSIGN THE UNIT. When you stay at Mayan Palace Nuevo Vallarta, you stay inside the magnificent Vidanta Nuevo Vallarta resort. 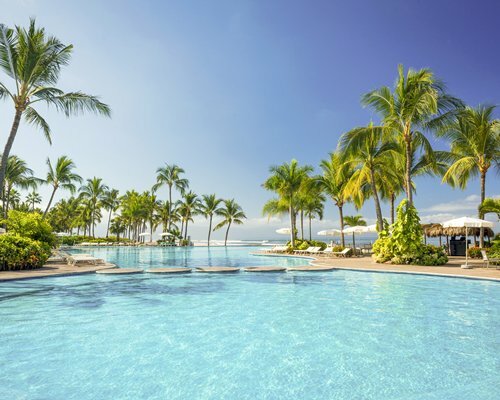 Nestled between the deep blue waters of the Pacific and the colorful peaks of the Sierra Madre Mountains along the Ameca River, Vidanta Nuevo Vallarta offers you over 500 acres of tropical beach paradise. Miles of wooden jungle pathways connect five resort hotels to an endless array of amenities— The Nicklaus Design Golf Course, The Norman Signature Golf Course, Brio Spa & Fitness Center, nightly entertainment, world-class restaurants, stunning pools, activities, games, and sports for the whole family—all of it surrounded by immaculate gardens, lakes, and the golden beach. 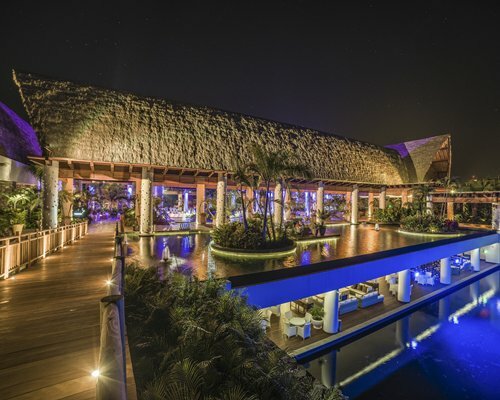 Vidanta Nuevo Vallarta at a glance: 5 resort hotels, 530 acres of paradise, 1,079 yards of beach, The Vidanta Golf Academies, Spatium and Brio spas, 38 bars and restaurants, Exclusive shopping at La Plaza and El Mercado, 27 pools, Aqua Park, Lazy River and 9 miles of wooden pathways. The resort is approx. 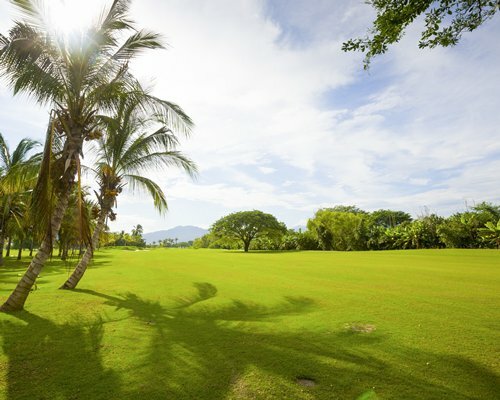 10-15 mins from Puerto Vallarta International Airport. Leave the airport, keep left towards Tepic, you will find the signs that will take you to Vidanta Nuevo Vallarta. The entrance is across the Ameca River to the right. Resort offers one-way transportation from the Airport to the Hotel. To request this service, please access this link: https://shuttleservices.vidanta.com. Enter your RCI weeks ID plus the relation number confirmed, and follow directions to book it. If booking for a guest, subscriber's RCI weeks ID plus relation number must be provided along with the guest's last name on the reservation. Transportation must be requested at least 48 hrs prior the check in date. To receive the service, you must provide the confirmation received upon arrival. Resort amenities fee is 378.00 U.S. dollars. Only Credit Cards accepted. Mandatory resort fee per 1B unit, per week. Resort amenities fee is 630.00 U.S. dollars. Only Credit Cards accepted. Mandatory resort fee per 2B unit, per week. Mandatory resort fee per 3B unit, per week. Mandatory resort fee per 4B unit, per week. Resort amenities fee is 252.00 U.S. dollars. Only Credit Cards accepted. Mandatory resort fee per Hotel unit, per week. Mandatory resort fee per Studio unit, per week.